When you get veneers, it usually requires three trips to the dental clinic. First, you need to go in for a consultation. The other two visits are for construction and application. One or more teeth can undergo the veneering process simultaneously. It is important to know that getting veneers has its advantages and disadvantages. Since they are permanent, you need to carefully weigh the pros and cons before you get them. 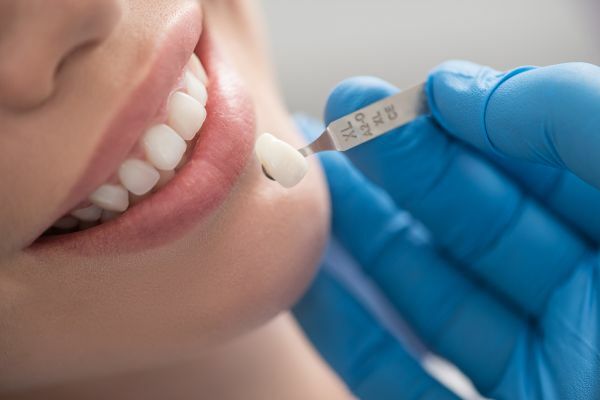 This dental veneers overview will help you decide if the procedure is for you. Pro #1: Whiten your teeth. Veneers are an easy way to whiten your teeth for good. They are also stain-resistant, so you do not have to worry about discolorations in the future. Pro #2: Fix cosmetic problems. Veneers are the perfect solution if you have slightly crooked or gapped teeth but do not want to wear braces. They will not fix the issue, but nobody will know. It will be your and your dentist’s little secret. Pro #3: Replace damaged enamel. Veneers are an excellent treatment for damaged enamel. Plus, they are aesthetically pleasing. Con #1: Expensive. Their price varies on the dentist, location and number of teeth restored. One thing is for sure: They are expensive. Con #2: Increased sensitivity. You may be more sensitive to hot and cold temperatures for a few days after the procedure, but the sensitivity will go away. Con #3: Irreversible. Veneers are a permanent solution. They will keep your teeth and smile looking great for years to come. As part of the dental veneers overview, it is vital that you know the things that you need to consider before and after getting veneers. Discuss all of your expectations and treatment options with your dentist for all of your dental care. First and foremost, your teeth and gums must be healthy. Before your veneers are placed, visit your dentist to treat any disease or decay. Secondly, veneers are thin, and they may chip or break. If you clench or grind your teeth, they may not be the right solution for your dental issues. Thirdly, veneers may come loose over time. In this case, you may need new ones. After getting your veneers, you need to visit your dentist regularly to keep your gums and teeth healthy. These porcelain laminates can chip or break under pressure, so avoid biting your fingernails and chewing on hard objects. It may also take a few days before you get used to the feel of your veneers, but let the dentist know right away if your bite does not feel correct after they have been placed. Lastly, brush and floss each day to avoid getting cavities. Dental veneers are an excellent way to hide discolored, crooked and gapped teeth. However, make sure you know the pros and cons before getting them. Remember, these laminates are permanent. Request an appointment in our Tucson office here: http://www.simplysmilesdentist.com.